ID: Series of crescent shaped marks along back. Body color varies and includes browns, reds, yellows. Similar shaped body as the saddleback gunnel. Comments: Most gunnels stay well hidden by day in tight cracks and crevises. These unusual little fish often venture out at night and are sometimes very approachable - but not always. I am always amazed how fast they can dart away. Now you see it - now you don't. ID: Narrow head and body. Brown or red patch-like markings, with lighter patches highlighted by spots. 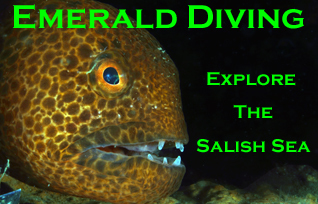 Comments: I only note this thin bodied gunnel in the San Juan Islands and along the Strait of Juan de Fuca. 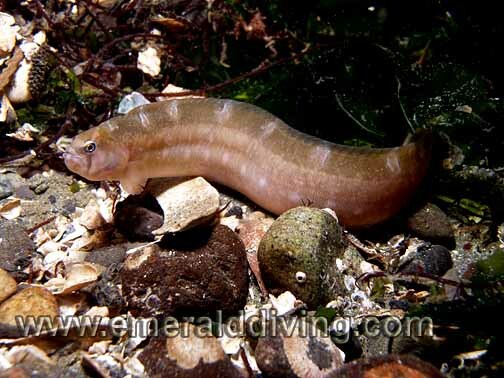 My best luck for finding this species is at Lawrence Point in the San Juan Islands - in fact I have yet to do a dive at this site and not find a longfin gunnel. ID: Black bar through eye. No distinctive markings across back. Typically has a row of small spots the length of the body. Color typically solid green. Comments: I very infrequently encounter the largest of the gunnels in Northwest waters in the open. 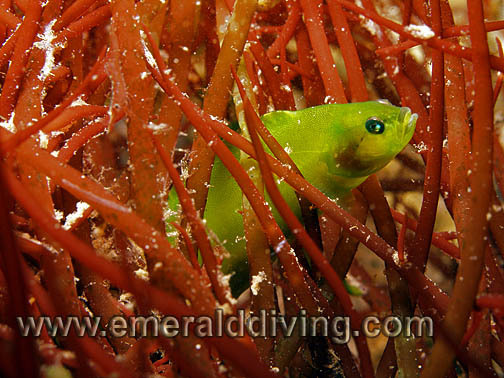 I more often find the penpoint gunnel peering out from a well protected crack or crevice in a reef. ID: Dark bar through eye. Dark patches across back that resemble �saddles�. Color can vary, but typical body color is brown with lighter pink-brown patches. Often has orange patches on and just behind the head. 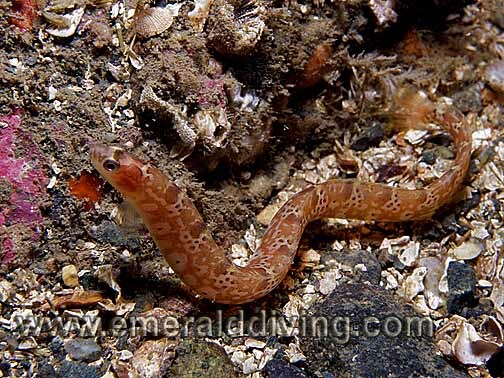 Comments: Like the crescent gunnel, the saddleback gunnel appears to be nocturnal. 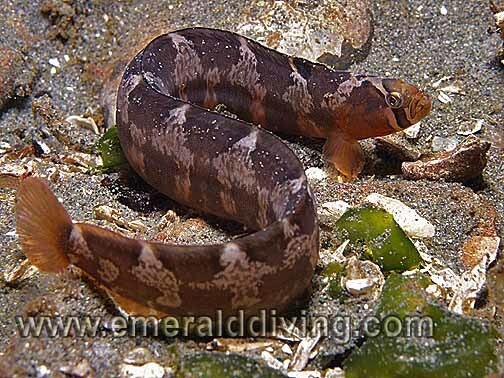 I rarely encounter this eel-like fish in the open during day dives, however night dives are a different story. This gunnel often seems to have an almost intoxicated dispostion when I confront it at night. I guess I would too if someone shined a bright light on me in complete darkness. 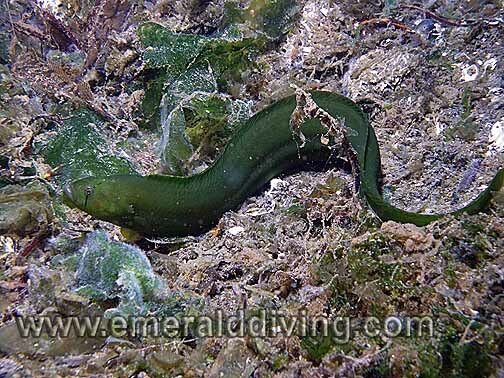 ID: Solid bright green, slender eel-like body with small pectoral fins. No spots. No dark bar through eye. Comments: I rarely encounter this little gunnel. In fact I have only noted it once at Three Tree Point, which is where this photograph was taken. This rockweed gunnel was intertwined in a grove of succulent seaweed in 10 feet of water along the shoreline.